Do you want some spider spaghetti? Put a bunch of food flashcards on the floor. Have the students ask the teacher, “What do you want to eat?” The teacher answer, ” I want some pizza.” The first students to touch the pizza flashcard gets a point! You can change it up by having the students answer the question. Be sure to check out the What Do You Want to Eat? Song Part 1 for more food vocabulary. This song focuses on using “want” and “a”. For example, “I want a hot dog.” I hope this is helpful. Happy singing! Questions: Do you have a favorite animal? Can you see the lion? Where is the lion? Vocabulary: zebra, lion, elephant, crocodile, monkey, and tiger. Phrases: I like zebras. It’s a lion. The idea of this song and video is to teach the animal names in a natural way. It is a bit different than drilling the same question and answer over and over. I hope that this type of song will help students be able to have a conversation in a natural way. Watch the video with the students. Depending on the students age or level, you do not have to pressure them to sing along. They can watch and learn. After watching the video, you can use flash cards to make sure they learned the animal names. Use small game cards to play the animals matching game. Put the cards face down, and the students have to pick up the cards and find a match. I hope you find these ideas helpful. Be creative, have fun and your students will too! Happy Teaching! Hi, Friends! I want to share a fun and simple game with you that I use often in my classes. If you follow the Dream English Kids YouTube channel, you may have noticed that I am making videos on the theme of Zoo animals. This has been a lot of fun, and I hope useful in your classes. 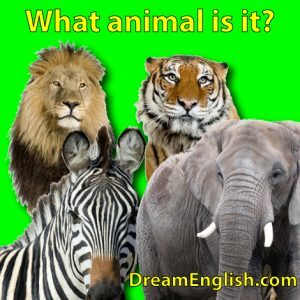 The Animal Guessing Game uses animal vocabulary, animal sounds, and a bit of fun acting. This is how you play: Introduce some animals using flashcards. For example, a lion, tiger, elephant, and zebra. After introducing the vocabulary, show each card and act like the animal with sounds and actions. Asks the students to follow along. Next, ask the students to guess which animal you are imitating. After you have done this a few times, let the students take turns. When one student is acting like an animal, ask the other students to guess the animal. Make sure every students gets a chance to act like an animal! I hope you find this fun and useful. Happy Teaching! Games are a great way to use vocabulary with students in a fun way. Children naturally love playing games, and it can be fun for the teacher, too! I used to think you need to have new games all of the time. Now I realize that a few great games can be played over and over in class. Simply switch out the vocabulary when you are teaching a new topic. This is a really simple game that you can use with any flash card set. You do need a set of paper cups to play this. 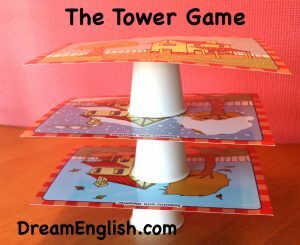 After teaching a set of flash card vocabulary, simply use the flash cards and cups to build a tower with the students. You will need to use laminated flash cards for this to work. Place a cup on the table and ask the student’s a question, “What’s this?” When they answer correctly, they can place the flash card on the cup. Put another cup on top of that flash card, and repeat with the next student until you run out of flash cards, or the tower falls over. You can use a lot of good phrases here like, “be careful” and “Oh, no!”. What’s your favorite game to play with students? Check out my Dream English Tips Podcast to learn about some more games! Hi! In this episode I talk about my Top 5 Classroom Games for teaching English to young learners. You only need a few good games that you can use over and over again with differnet vocabulary. Have a listen for some of my students favorites. Visit the Kids Games Page for more fun game ideas! Click to Listen on PodBean.